Well. It is finished. BUT I wanted to tell you about my last week. We had some good things happen. Monday we had sort of a funky short pday. At 2 we had a bunch of strangers come through our apt and look around like our lives were a museum or something. No we just had an apt open house. We think the office is going to try to sell it. Oh well I won’t be there. We had family home evening with Familien Andersen! We made them all little missionary name tags and talked about how they can be missionaries. I love that family. Especially little Sofie. Tuesday we had my very last district meeting. And every time I think I’ve given my ‘farewell’ testimony I am always asked to share it again. So it was this time. It was horrible because Elder Jensen gave the most incredible district meeting on facing adversity and I was bawling when they asked me to share my testimony. Thanks guys. Our friend Peifang randomly went to China to visit her son for a month but she said she’ll call us when she gets back 😛 we’re not really worried. She loves the church. Thursday was Sankt Hans Day! Last year when I was with Sister Floyd they had sort of a city fest with a billion drunk people. It wasn’t super fun. This year we had a ward party in someone’s huge backyard with a great big bonfire to burn the witch! Luckily someone suggested we light the fire before it got dark because after some time it started to rain HARD. We biked home from our ride’s house because that’s where our bikes were. We were completely soaked. Super fun though. Warm rain is wonderful. The next day, after finally meeting one of the investigators the elders had before us who’d been on vacation on Iceland for almost the whole transfer, we bikes from her house to the temple! We got permission to go one more time before I left because I didn’t get to for my 60 day meeting. I was so happy. I love the temple. I also love it in Danish. I got such a strong feeling, sitting in the temple, that it was time to go home. Saturday we took a nice train down to the lovely town of Slagelse for a man named Frank’s baptism! It was so great! Frank is a stellar man. It was also wonderful to see everyone down there. They had a BBQ in the parking lot after the dåb. It was a little funny because I was there this time last year at that same BBQ. We barely made it home in time to make it to soccer with our district and a few investigators. Sunday was hard. Things started to hit. 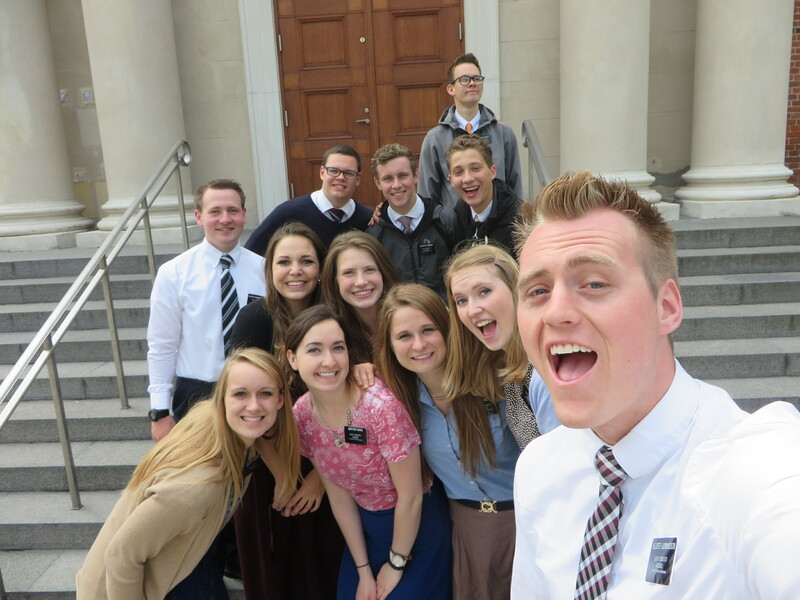 I said goodbye and took pictures with a bunch of wonderful ward members. Bishop Paulsen gave me a year and a half to get married. I said okay. I stayed after the Gladsaxe 2nd ward got out so I could say hello to the Bishop and his family from Esbjerg who were visiting. I pretty much attacked Marie-Helene in a giant hug. After we went home, Sister Sørensen did weekly planning while I packed. I’m used to cramming a lot of stuff into those small spaces, but it was a lot harder this time because everything has to be under a weight limit. That took most of the day, then we went out for the last hour to street contact. My last hour. We talked to some people. Have a Book of Mormon out to this nice Filipino lady. I also told this lady that I liked her dress, she looked at my name tag and said, in English, “God bless you”. Made my whole day. The next day was spent with interviews, last minute souvenir shopping, goodbyes to many people, including my beautiful companion. Super hard. I love her so much. And then all 15 of us missionaries going home partied at President’s house. It was a party this time. We had ping pong going on, everyone gathered around the piano singing, pictures, yummy food, a training about marriage… Good times. Early the next morning we left the beautiful land of Denmark and got on a plane home. It really was a party on the plane. On the flight from Amsterdam to NYC we had a giant chat going on. Elder Daw, one of the Icelandic elders, tried to teach me Icelandic. I was surprised that I could pronounce it, but I can’t remember anything. Ok. I’m almost done. I just wanted to tell you about a miracle. So in NYC four of us got separated from the rest of the group and a nice plane lady told us to go through security in terminal 2 rather than 4, where we were, because the lines would be shorter. We did and got to our gate, which was right by security, 10 mins before they were going to start boarding. We didn’t see anyone from our group. I was getting super anxious and started praying nonstop. I didn’t want to see my family if they didn’t get to see theirs. After about 5 mins Elder Sakurada and Elder Porter run up, sweating, to tell us that they just made it out of security in terminal 4 and booked it over here but all the others were 40 mins behind ano they weren’t going to make it. We boarded the plane and I couldn’t sit still. Finally we saw Elder Sakurada walking down the aisle and he gives us a big thumbs up. 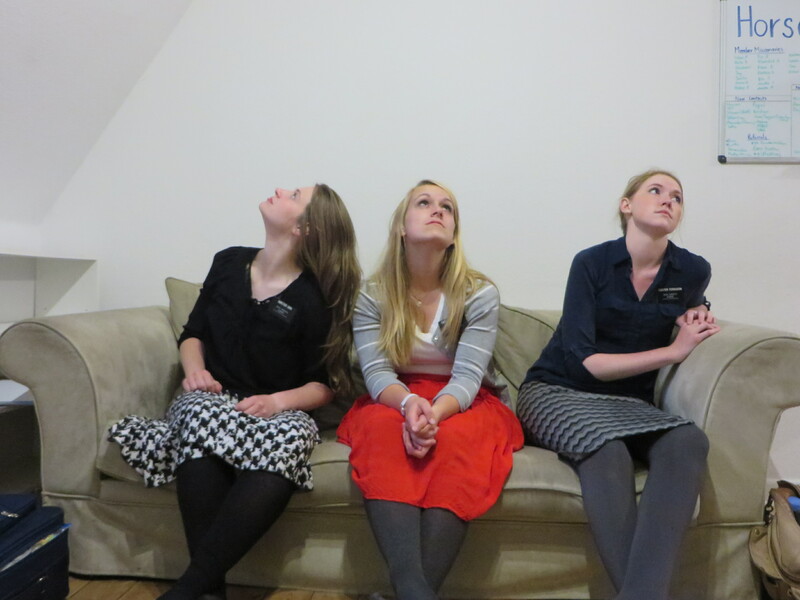 I then saw Sister Landvatter and Elder Dickson and Elder Carroll and I just started bawling. I was SO happy. I know that God answers prayers. Our flight was 15 mins delayed. Miracles people. So I’m home. It’s strange. I’ve had such a great mission. It’s been incredible. I’m honestly trying not to think about it because it makes me emotional to think about, but I loved it. Danmark ejer en del af mit hjerte, for evigt og altid. OH my gosh. Oh. My gosh. Guys guys guys. This. Might be the last time I email (might). on my mission. What is this life? It’s here. 70-something letters later. This is it. No. I’m going to have to get on and tell you about this upcoming week next week at some point. It’s going to be a good one. Just a few sneak peeks: Holy houses. Bonfire. Baptism. This past week has been a good one as well. 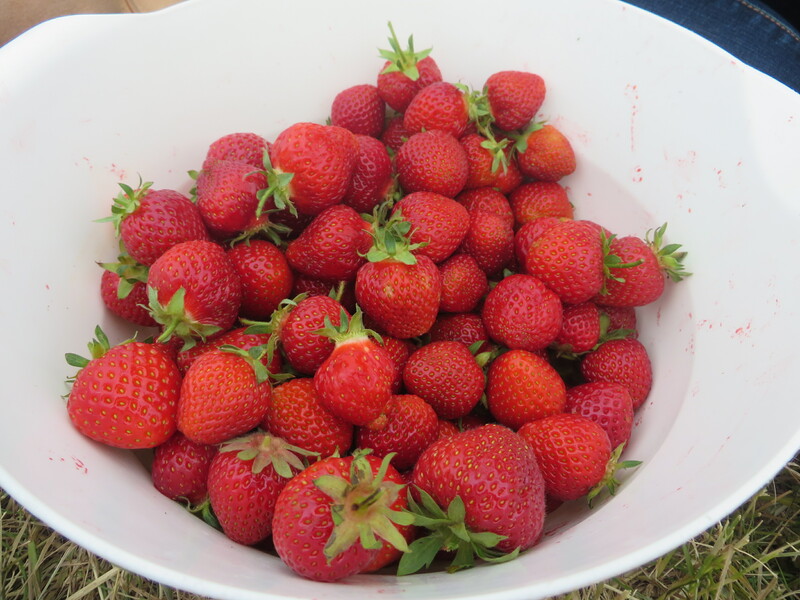 On Monday a member in Gladsaxe 2nd ward took us strawberry picking! It was such a fun thing. Those berries were HUGE! And you could eat as many as you wanted without paying for them. You only paid for what you had in your bowl. Fun memory. What did you do for your P-days? I picked strawberries. Our friend Peifang is SO cute! I love her. Things are going well. We had dinner with her at our ward mission leader’s house the other day and she bonded with his wife because she taught history and one of the things she taught about was Chinese history. Instant BFFs. Thursday we had splits up in Birkerød! 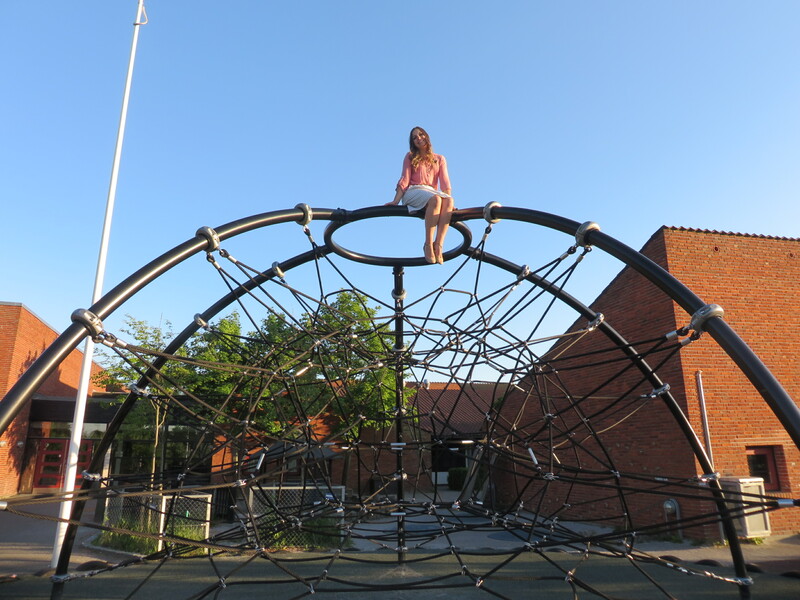 When I was up there on splits with Sister Lyman back in January I told her that I hoped I could see Birkerød in the summertime. 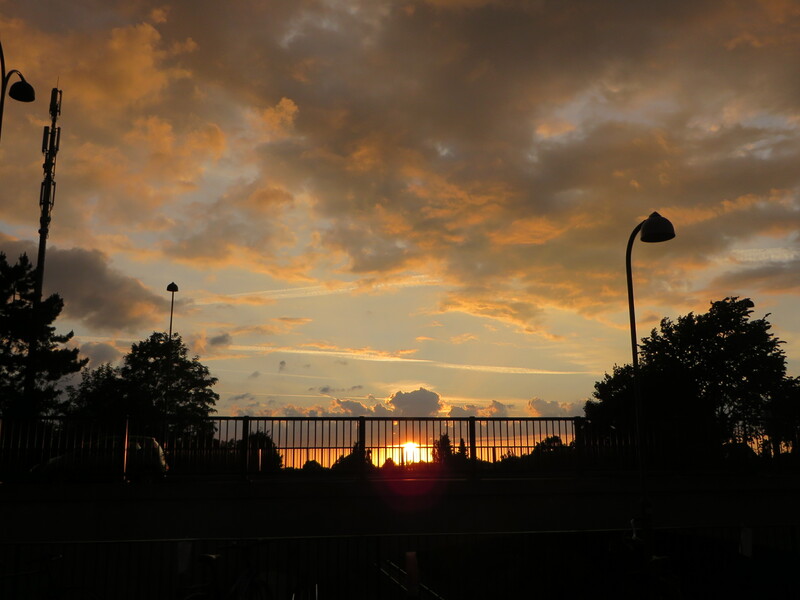 Rumor is true: Birkerød is a beauty in the summertime. SO many trees. 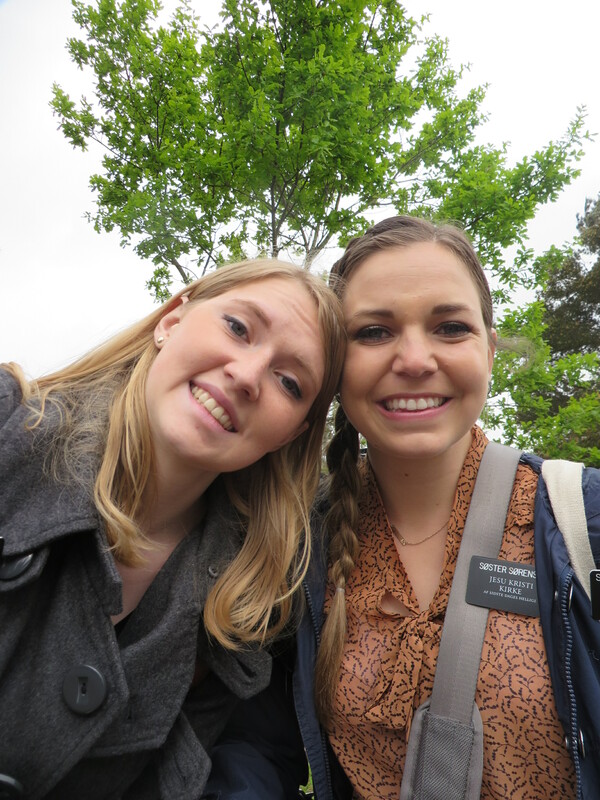 Sister Hansen and I contacted around a pond right by their apt. Had some good conversations, but I think the mosquitoes thought I was offering my legs as a free meal. I think I have like 8 bug bites. Stakkels ben. We did a service project with this member named Lisbeth and she and I bonded. I love that woman. I know her daughters in Esbjerg. She bought us ice cream. She also let me prune her hedge. I love her. Good week. Good day at church yesterday. I want to read the Howard W. Hunter Sunday school manual cover to cover in English when I get home. SO many gems in there. Like the other week we had a lesson on “Ægte Storhed” (“True Greatness”) and I was translating and almost couldn’t continue because I was tearing up. So good. I’ll have to tell you about it another time. Halløj. Random weird word I keep hearing everywhere. Is it Swedish? Comes it from København? They didn’t say stuff like that over in Jylland. This week has been one of splits! I wasn’t with my companion for 3 days. I missed her, but I also had a BLAST with the sisters here. I was on splits with Sister McArthur and then Sister Naylor, who are both in our district so we see them all the time, but it was fun being one-on-one with them. I love this calling so much. It’s probably my favorite one I’ve ever had. It’s all Things I’ve always done: helping people Work through difficulties, give advice, support and love them in their Work, be someone they can talk to, have fun… STL is the best calling ever. I also got to go up to Allerød’s district meeting and give a training with the zone leaders. 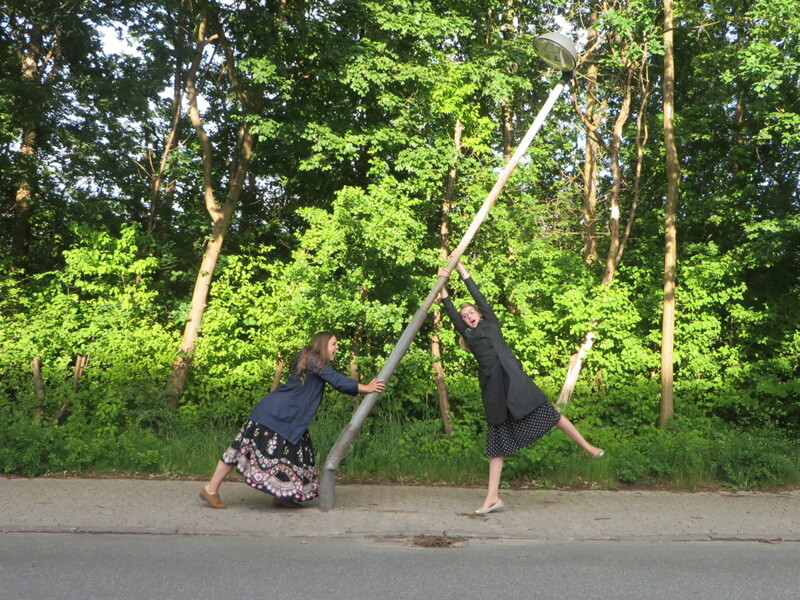 After going out with the Lyngby sisters, our friends up in Birkerød, Sister Hansen and Sister Landeen, came Down to join the splits bandwagon! We had so much fun. Sister Landeen and I bonded over SO many random Things, like how both of our dads love the movie “The Quiet Man” and we’re both film score nerds. She’s funny. She’s from Sandy. Saturday morning all 4 of us went to that one service project I told you about last week. It was for a lovely Iranian woman. We cleared and piled a bunch of Sticks. It was enjoyable. I felt like my mom, doing a bunch of hard-labor yard Work. She kept saying, “PLEASE stop when you get tired” over and over. But we didn’t get tired. Don’t you remember that one scripture that says, “Ye shall haul Sticks and not be weary and ye shall pile them and not faint.” We got that job: DONE. Well I have 2 weeks left. If didn’t say it, someone else would. It’s super sad meeting new people right now because they’re just like, “How long are you here in Denmark?” and we’re just like, “A year and a half”, then they ask how long I’ve been here… “…a year and a half…” “OH! So you’re going home soon!” “Yes. Yes I am, thanks.” Or the members will be counting Down for me, like they want me gone or something. Nah, they love me. I love this Ward. I’m super sad I only get to serve here for 1 transfer. It’s an incredible Ward. 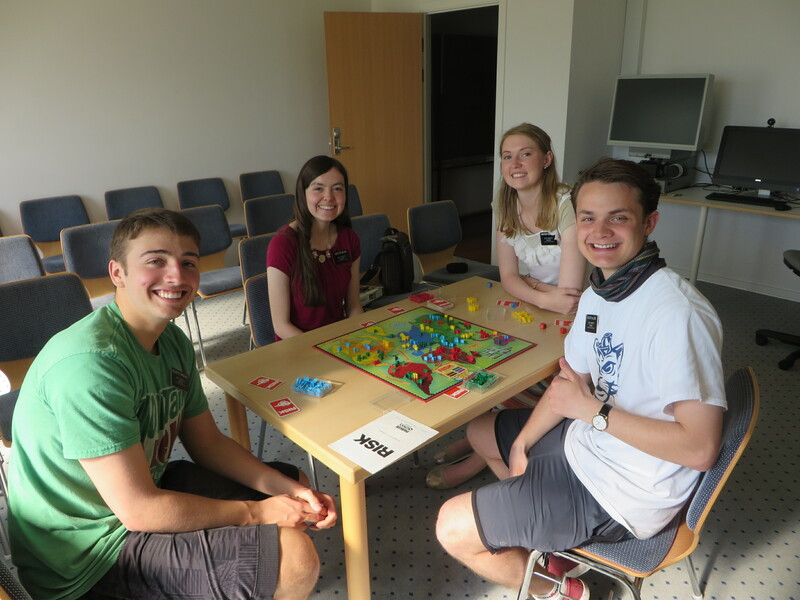 Saturday night we had a super awesome Ward activity! The elders and us did a skit. It was funny. It was my idea. It was also the only idea. So yes. We ate pig and drank saft and hyggede os. Not only that but it’s getting bigger! You want to know how??? Our friend Peifang (the cute chinese lady that I’ve been talking about) is getting baptized on the 16th of July! She is SO excited. We thought we were going to have to take it a little slower so she’d be able to understand better, but no! She understands everything (also with help of pamphlets in chinese) and she remembers everything too! She explained to us what repentance was even before we’d taught it! She also came to the Ward activity and LOVED it! Yesterday she told us that she doesn’t feel alone anymore. She feels like she has a big Family. Well. Life is good my friends. I never want to leave. OH! Yesterday we randomly kiggede forbi the church to grab some butter from the elders who were there and there were a bunch of cars in the parking lot. We were perplexed, but decided to investigate. As we pulled up to the church I saw VIBEKE AND BISHOP FROM SLAGELSE!!!! 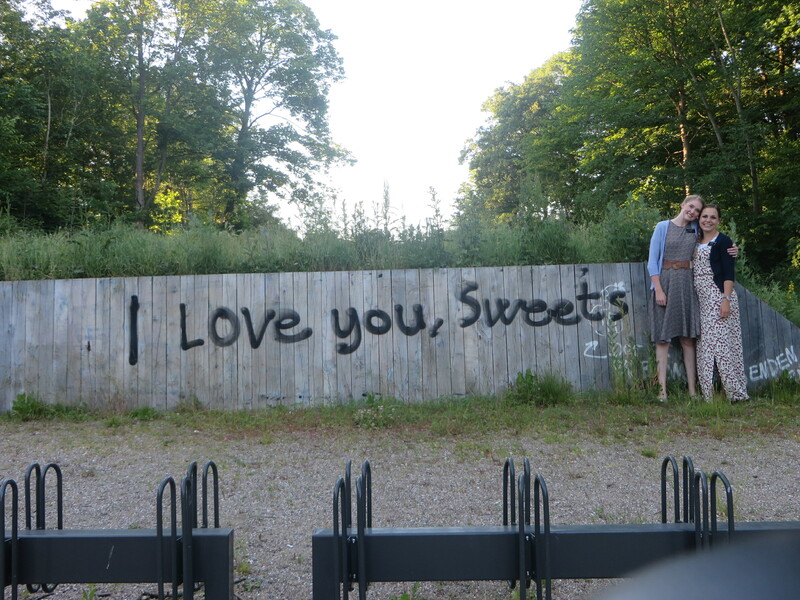 We chucked our bikes off to the side and pretty much attacked Vibeke with a massive hug. And I gave Bishop Hansen a massive… handshake. I love those people so much! I thought I’d never see them Again! It’s people like that that are going to make me cry on the airplane home. I love people so much. They make life and missions complete. They also make it very hard to leave. Søs McArthur and I walking up to this man with a dog. Another funny story. So we’re at Bishop’s house, eating dinner, and Bishop is just talking to Elder Jensen about something then stops and looks over at Sister Sørensen munching away on her pizza. He asks, “Hygge du dig?” (“Are you enjoying yourself?”) but he says it fast so it’s like, “Hygge du di’?” Sister Sørensen got super confused because she didn’t know what he’d said so he repeated it a few times and we helped her by saying it slower. The lights came on and she says, “I thought you said ‘hygge doodah’! I was like ‘I don’t know that word'” I think I died. I was laughing SO hard. After gathering myself and calming downI look over at Bishop and he just says: “Doodah.” STOOOOOOP!!! Then he and his wife were whistling Camptown races while they did the dishes. Man! I can’t believe I forgot my planner again. Why does this keep happening? I must be getting old…. Hehe, no one laughs. 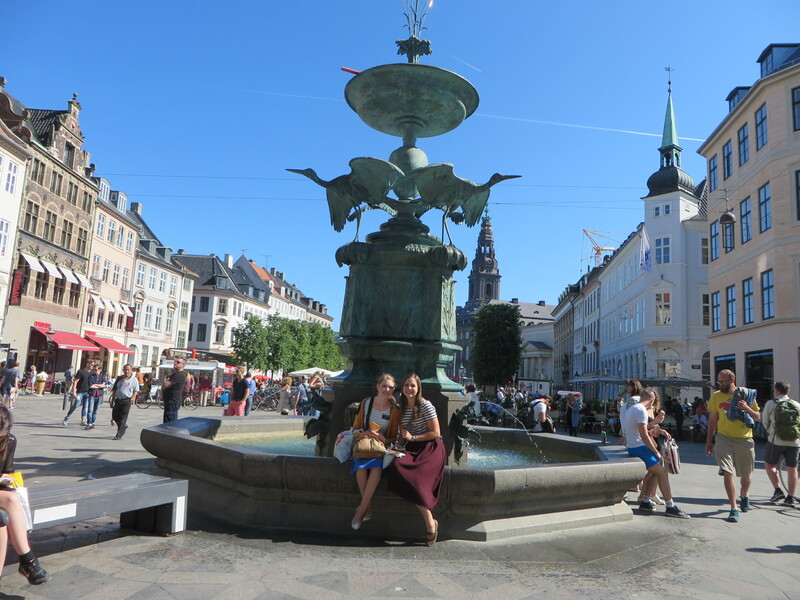 Last P-day, we were planning on doing some souvenir shopping on Strøget (Copenhagen’s gågade… walking street), but instead we went to Nyhavn (because Sister Sørensen had never been) and walked to Vor Frelsers Kirke! It’s a twisty one.. That’s all I can say. We walked up a billion steps to the top. Then we all got ice cream. I love P-days in Copenhagen! There’s always something to do. This week has been DEATH. It’s been so hot. I have almost no summer clothing. And we have no sister genbrug (leftover clothes) in this apt. I also have had the worst allergies ever. They just don’t leave. I sneezed like 16 times in a row the other day. Pray for my poor nose. We did weekly planning the other day and I think we almost melted into our little couch. Hardest things ever. On Friday we saw this advertisement for something called Søborg Natten up the street right by where we live. We had no clue what it was, but we got together with our district and came up with an awesome idea to grab our big family history roll-up poster and go out and family history contact on the street! It was SO great! So many people said no… but there were so many people that said yes too! I was very surprised about the number of gospel-related discussions that went on. 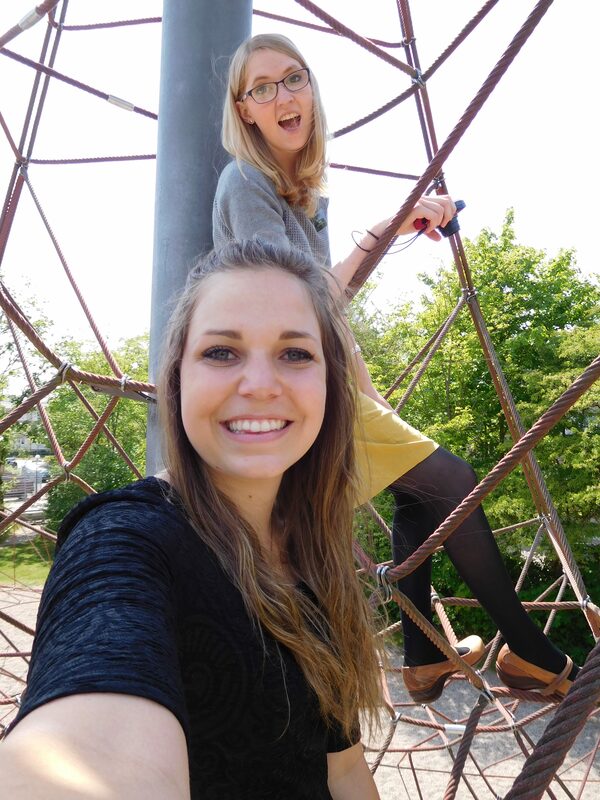 Sister Sørensen and I actually got a service project out of it! 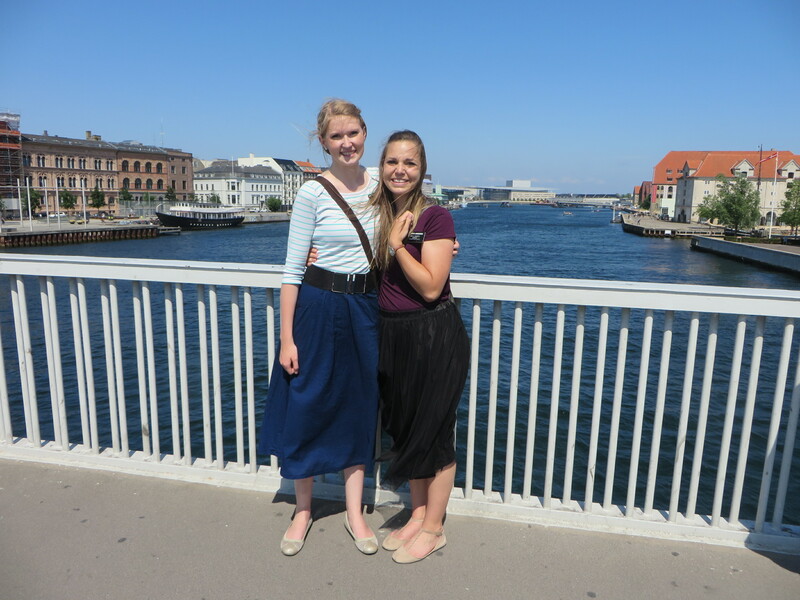 This lady asked what we’re doing here and Sister Sørensen told her that we were missionaries and we talk about Christ and do garden work, and the lady got so excited! We have an appt on Saturday 🙂 It was so much fun talking to all those people. Our friend from China came to church! She loved it! I love that the only Sundays I’ve had investigators come to church are on Fast Sundays. You just pray with your whole heart that whoever gets up won’t start talking about Kolob or something. 😉 Luckily it all was good. Every time our friend heard Jesus mentioned, her ears perked up. It was great! I love her. She’s coming to the ward activity on Saturday! Guess what else! Sister Lyman randomly showed up with her family! I love her SO much! I wish we could’ve been companions. She told me she’s coming to my homecoming because she’ll be in Utah. So happy. 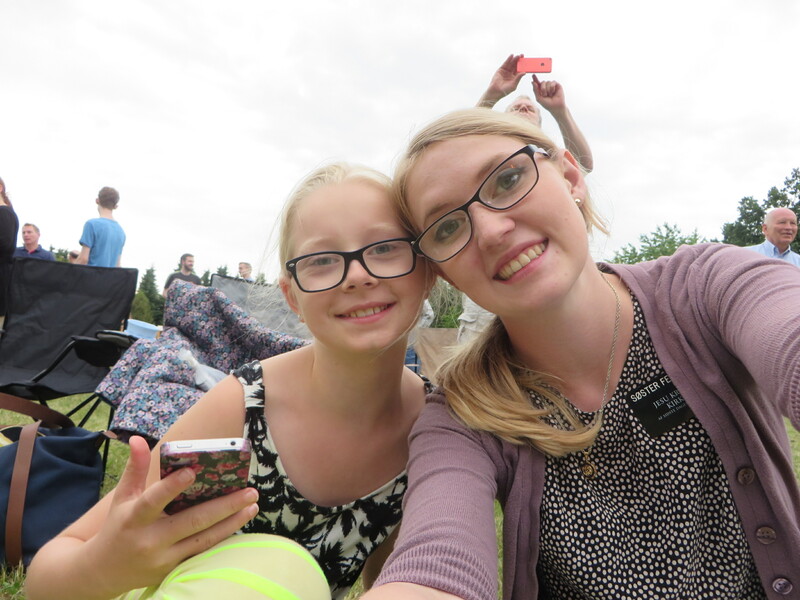 I got to translate in Relief Society for her mom. Btw, you all should be jealous, but we have the best ward in the world! We love our ward so much. We ate dinner at Bishop’s house last night and… I love Bishop. I love his family. I also really just love this ward. Søborg is the best. I am so grateful to be serving here. We have some good stuff going on, plus it’s summertime. no quotes this week guys 😦 I forgot my planner. 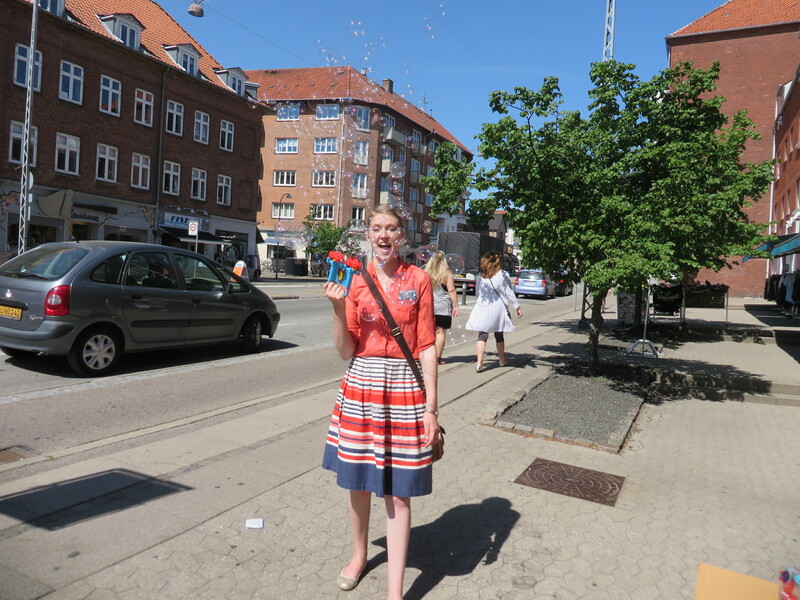 K, so P-days in Copenhagen are the best. Hello. Life is good. Life is grand. 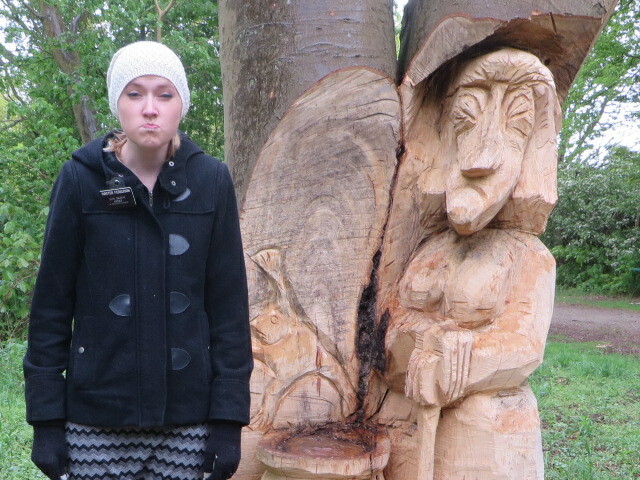 Summer is here… knocking on wood. I don’t have a ton of time, but I have a few stories. We’ve received 3 new referrals in the past week, all of them super positive it sounds like. One of them is this Chinese woman who was married to a Dane before he died. 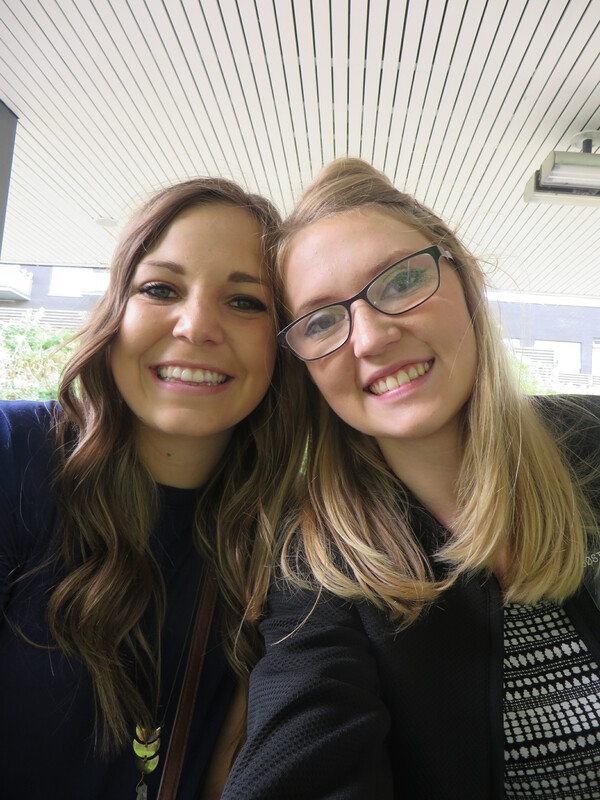 She randomly was in Utah (she didn’t tell us why) and went to temple square and thought, as she looked up at the temple, that she wants to go there someday. 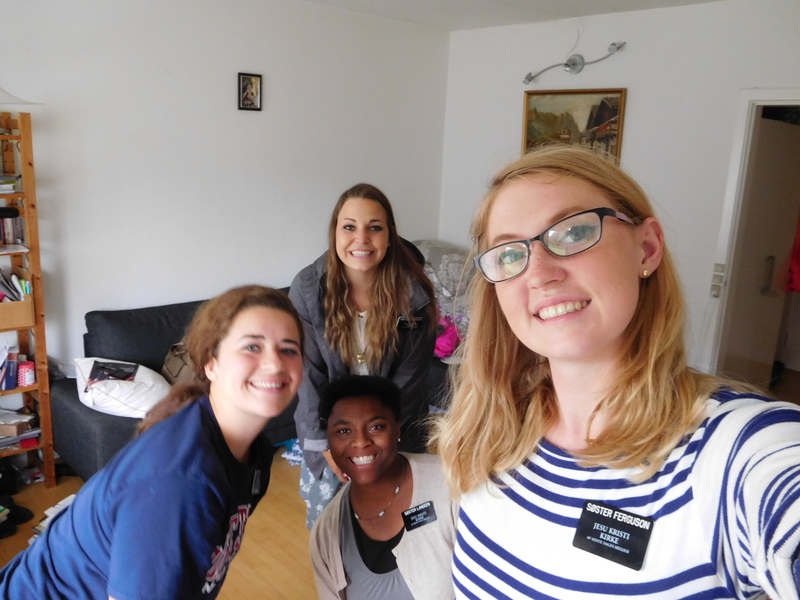 Then she was randomly in New York City, in Chinatown (she didn’t tell us why) and she got talking to a missionary who got her information and sent it to us! So we went and talked to her and she said that while her husband was alive, he was trying to get her to convert to Christianity. And then she told us, as she pointed to a picture of Christ, that she will believe in him. Her name is Peifang. We’re super excited to start working with her. Both Sister Sorensen and I role played inviting her to baptism at zone conference and felt good about it. The other two, one is from Sister Williams, her old investigator Sonja, who was SO positive and would’ve gotten baptized if her mom hadn’t’ve said no, but she lives in our area and Sister Williams thought it would be a good idea to stop by again. We’ve been trying but she’s never been home. Not giving up. The other one was from President and Sister Williams, the temple president and wife. They said that a woman was on the steps of the temple the other day and they recognized her as an old investigator from when they were the mission president and wife. They got her information and she actually lives in the assistants area, but the assistants said we could see if we could come down and meet with her. Our district is awesome! We have 4 elders and 4 sisters. 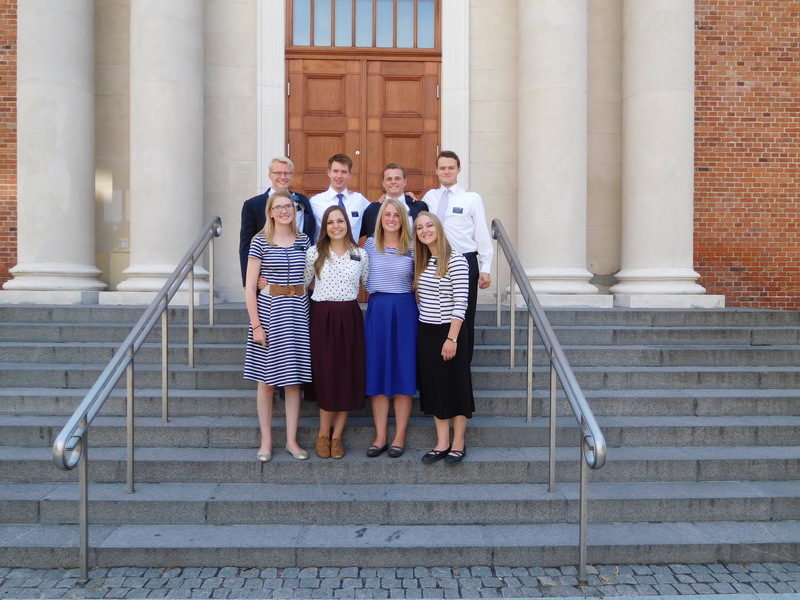 Elder McDougall and Elder Light, the zone leaders, Elder Foulger and Elder Jensen, our district leader, and the two Lyngby sisters, Sister McArthur and Sister Naylor. I actually love having more sisters in our district. We’re all really close. We had a super fun week. On Friday they had a GIANT stake dance party at our church and we got to help with the food and stuff. 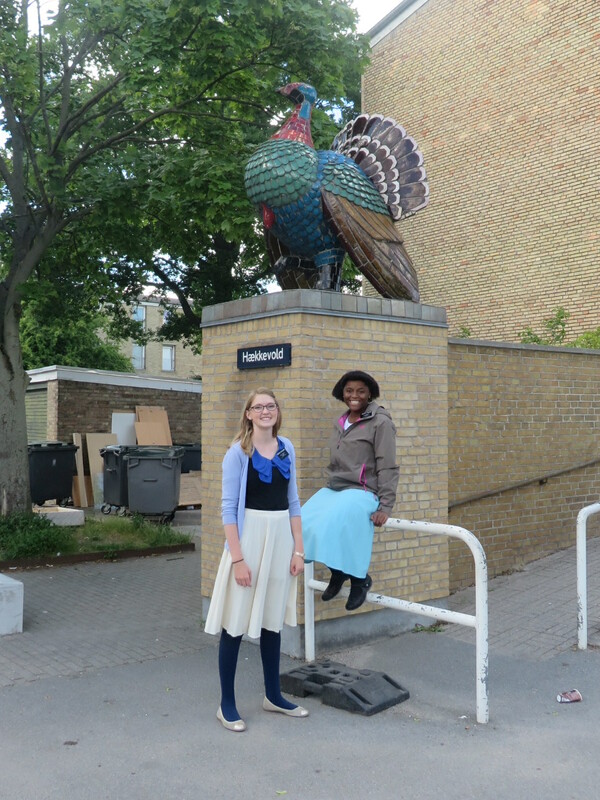 So many people I knew came – from both Slagelse and Roskilde. We felt like we were helping out at a wedding because we were there to help, not necessarily to participate, but it was still fun. We’ve had a billion eating appts. This is what happens when they haven’t had sister in the ward for over 6 months. 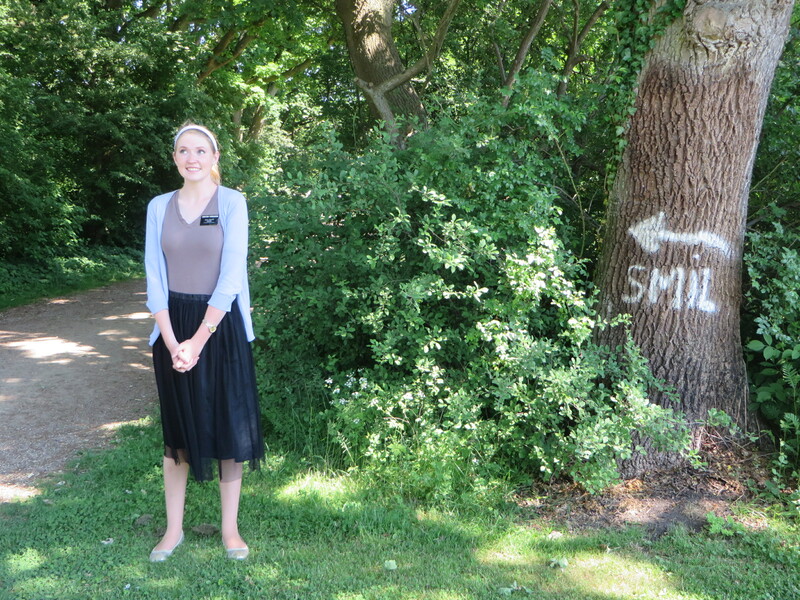 I can’t even remember when they turned this area into an elders’ area. 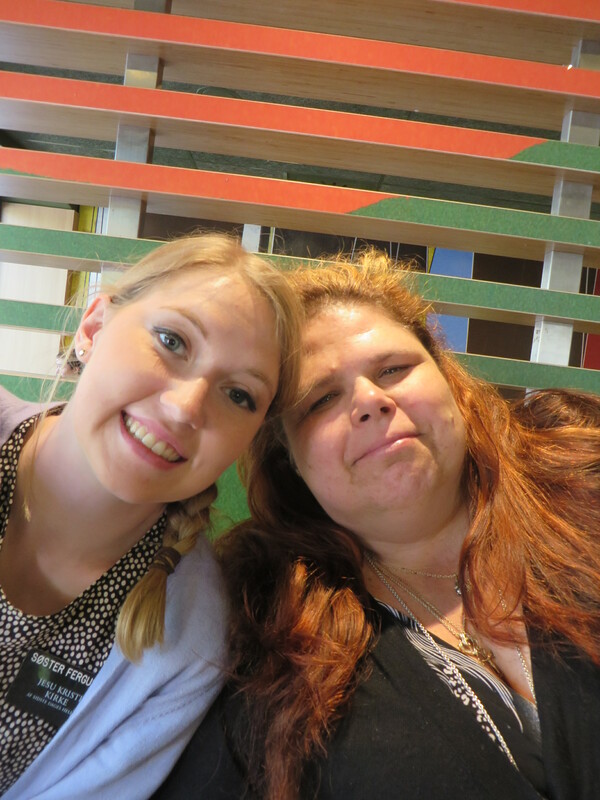 We also had zone conference up in Allerød! It was my last one. I gave a very weird testimony (not the testimony itself, but the fact that I was giving it) with all the other missionaries that are leaving. 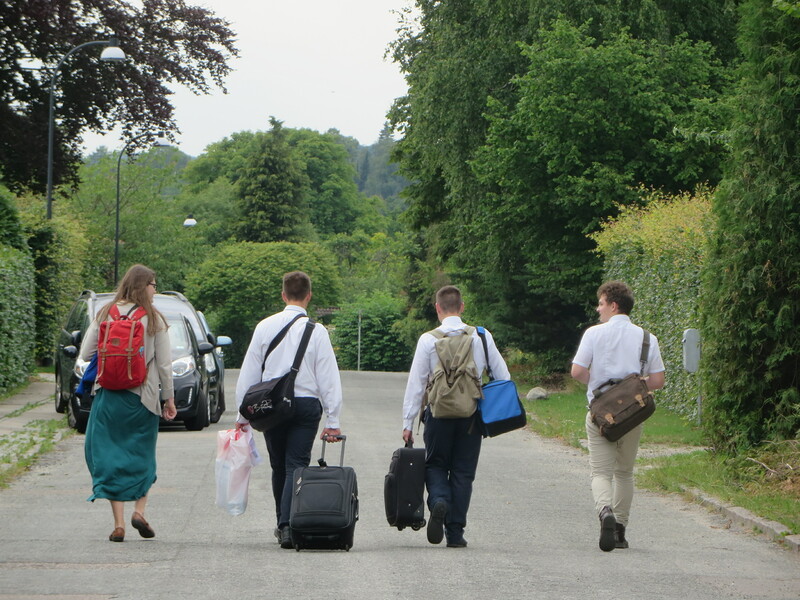 I remember watching so many other missionaries give their farewell testimony and thinking how far away that was for me. Nope. 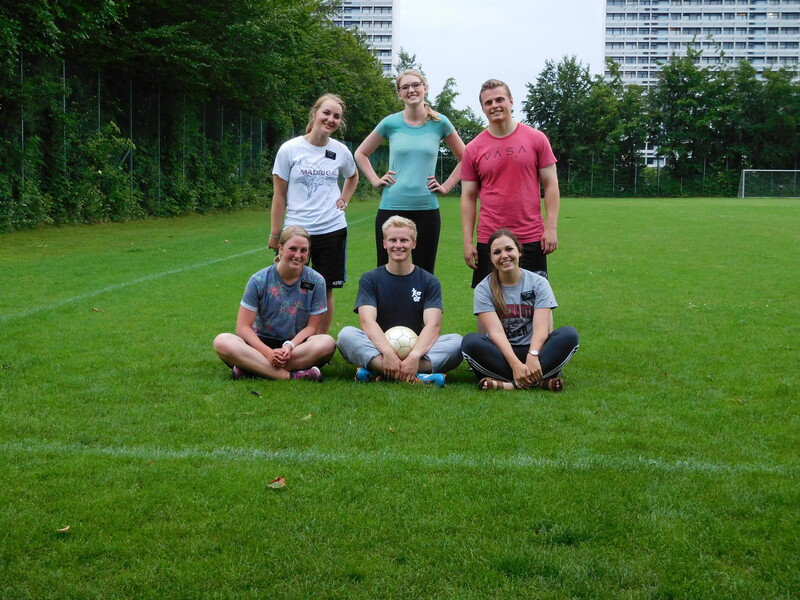 We played football (yes and yes. half ægte and half amerikansk) after the conference. 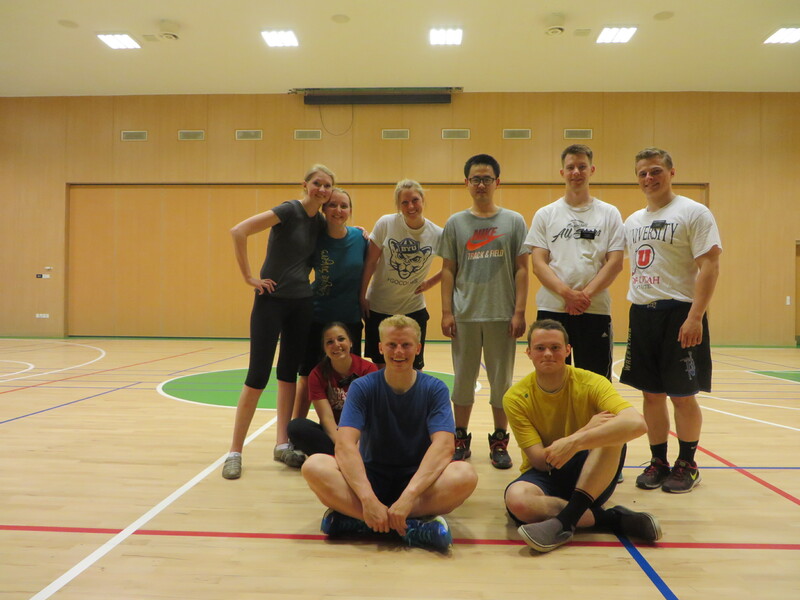 We’ve also been playing basketball here every Saturday. I love basketball. I also love soccer, but only when I’m playing with people who are at the same level as me which is probably a 5 on the goodness scale. Anyway, have a great week! I love y’all! Goddag goddag venlige mennesker. THIS. Has been one of the craziest weeks of my life. Let’s start at the very beginning. A very good place to start. So. Monday was my last day in Esbjerg. We had a few appointments in the middle of the day so when we came home, we spent the rest of the day finishing packing and writing notes to people. 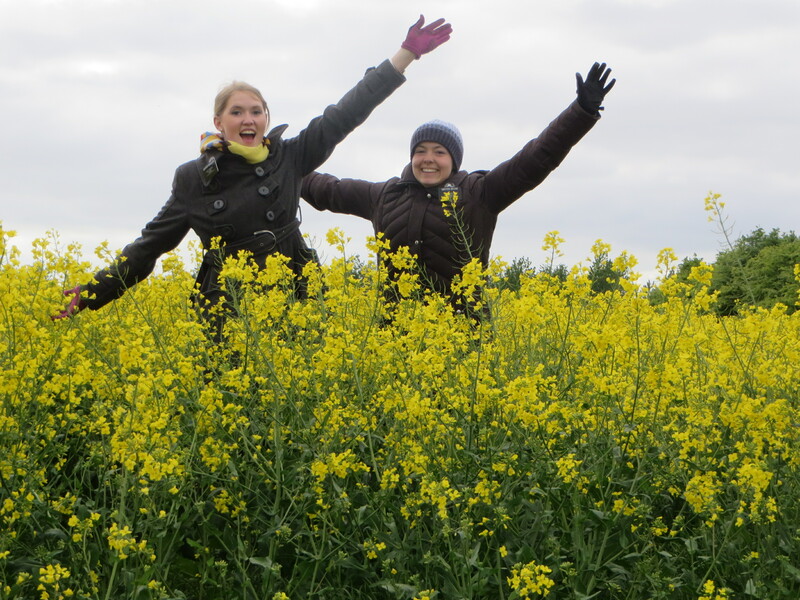 Then the next day we split and I went up to Horsens with Sister Orr and Sister Andrew! Let me just say that trios are the bomb. We had so much fun! 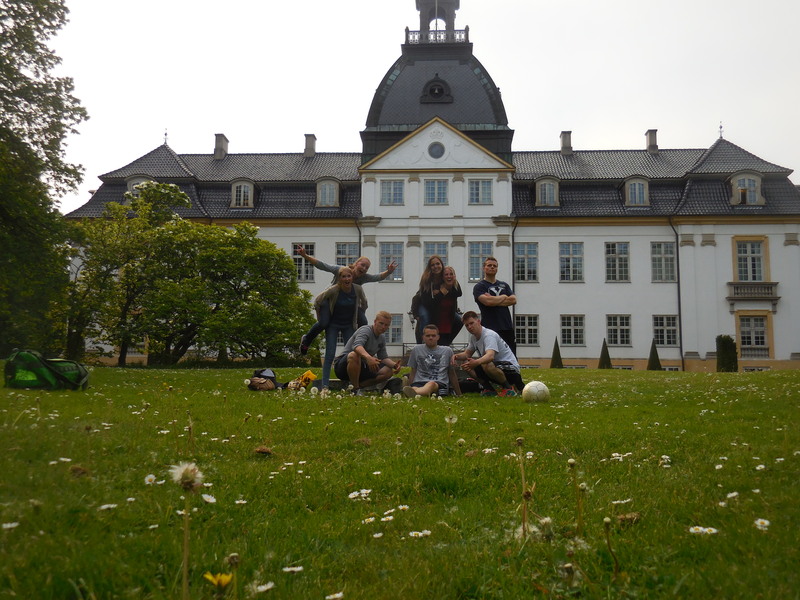 We spent 2 days in Horsens. 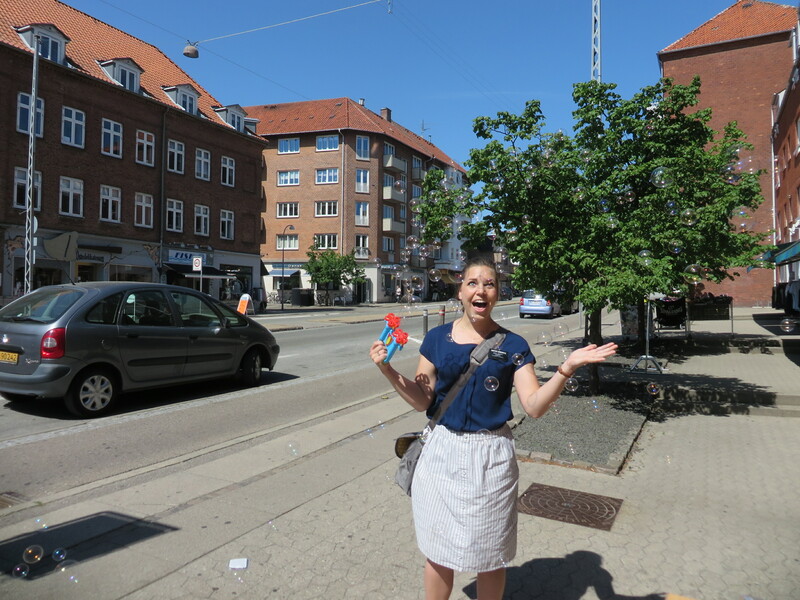 THEN on Thursday, bright and early (4:30am), we took a train to Copenhagen for Sister Andrew’s sprog test and because Sister Orr and I had Mission Leadership Council. 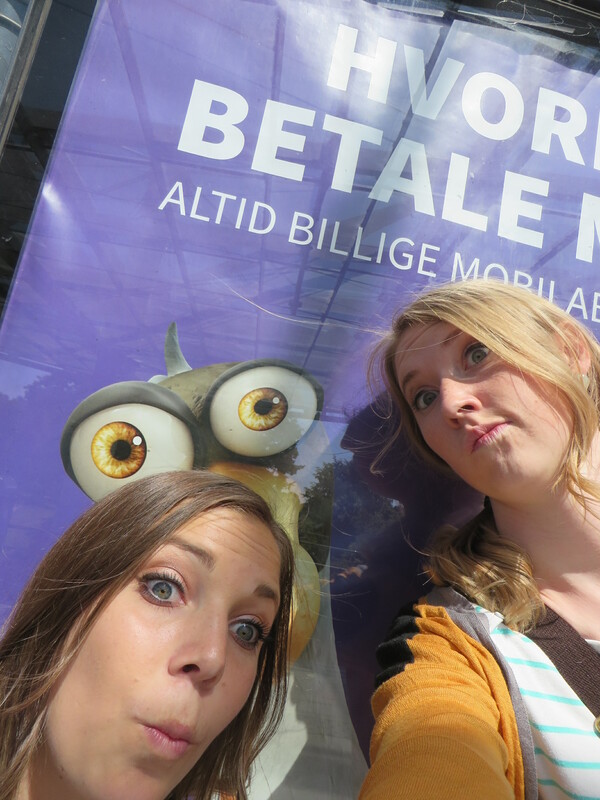 We ended up getting in to the language test place an hour and a half early. 😛 But we had a good time. So tired. Then a billion other awesome people showed up! 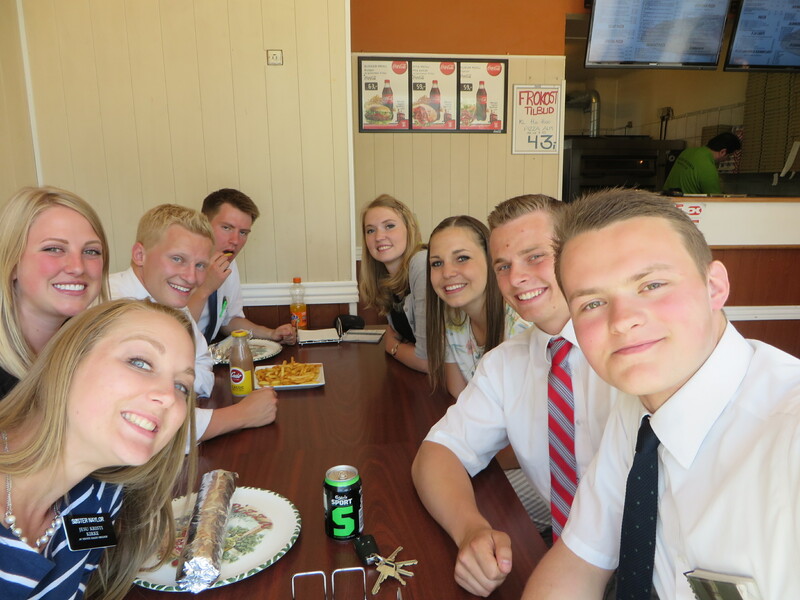 After our comps were done taking the test we all went over to the temple and to the mission office. Sister Orr and I split off and had some time before we had to go to MLC so we sat by this beautiful lake and talked and read PMG. 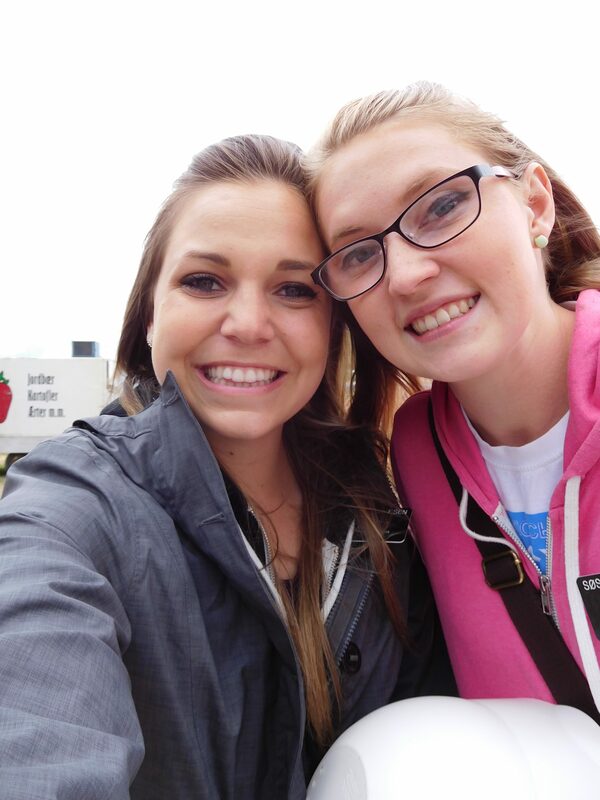 Sister Orr is a wonderful person. Good times. MLC was great. 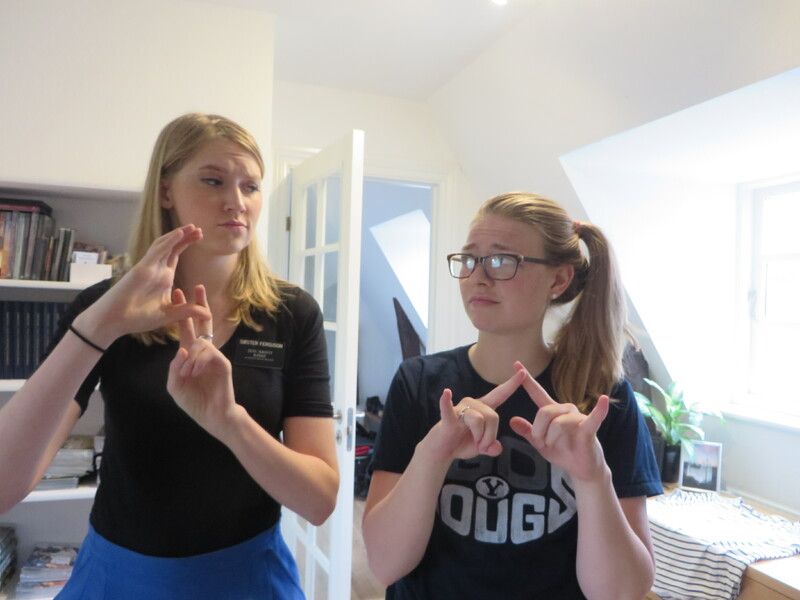 After it was over I asked President if he would give me a blessing because I was super stressed trying to figure out how I was going to be an STL for Nordsjælland while I’m over in Nordjylland, because we’d heard that Sister Baggaley’s comp might not get in for 2 weeks, rather than just one. He said that it wasn’t very smart or convenient to have me clear over there, so we made arrangements that day and picked up Sister Sørensen from Slagelse and headed up to Horsens to grab my stuff. The next morning Sister Sørensen and I took my stuff on a train to Slagelse and grabbed her stuff. We couldn’t have traveled with all that stuff without help. Thankfully we’ve got some great buff elders in our mission that were excellent helpers. Now we’re in the beautiful suburb of Copenhagen called Søborg. We live 2 mins from the church, and the elders’ apt that we took over isn’t as bad as we were imagining! It’s actually pretty great. The only downside really is that the bathroom is the size of the shower in Esbjerg. In fact, the shower curtain goes across the door and the toilet just sits there in the middle of it all. We were trying to imagine how they could have forgotten to plan a bathroom into the plan of this apt. Then they just had a brilliant idea to turn the supply closet into a bathroom/shower! Great idea guys. Also the shower only has 5 mins of hot water but we are dealing with it like champs. They’re bringing us a new couch, desk chairs, and mattresses today. We’re super excited to take over this area. The elders before us had some great investigators that we’re going to start working with. We pretty much had a major weekly planning/life planning sesh yesterday after church. Sister Sørensen is great. I love her. We have fun. 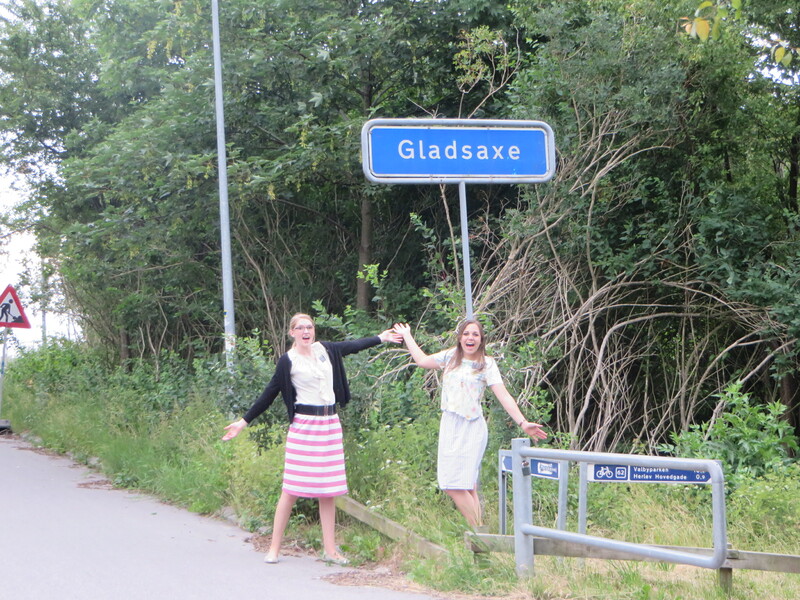 Welcome to Gladsaxe. Super excited to be here! Last day with Sister Bevan! Hey remember the crossing fingers for the weather to stick? Nope. It got cold again. In Utah when it’s super hot and it rains it’s warm and lovely. In Denmark when it’s super hot and it rains it brings winter back. Not only that but we’ve had a really cold wind blowing from the north which is never good. Just in case you were wondering about the weather. It’s horrible because I packed on Friday during weekly planning and I had to get some warmer clothes back out. I was so ready to not have to wear tights for the rest of my mission 😛 Bahh. Our buddy Michael dropped us. 😦 This is the second time he’s dropped us right before his baptism. I’m not as sad as I should be? That man will be baptized one day. God’s still got His eye on him. We’ve had a lot of really incredible lessons lately! I love people. It’s also really sad because I’ve had to say goodbye to SO many people. Esbjerg has been really hard. I’ve been here forever. All winter long, BUT the thing about being in one place for so long is that you really get to know people. Yesterday when I gave my farewell testimony I felt like I was in my home ward. I knew the name and face of every single person in that congregation. I love these people! It’s also so incredible to see people progress. I love hearing an investigator say their first prayer. It’s always so beautiful and sincere and the Spirit just whooshes in. 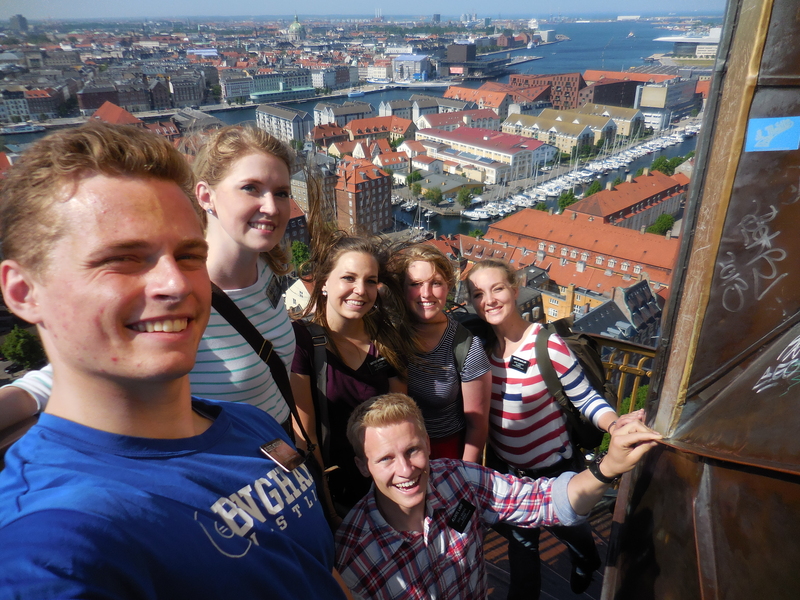 Esbjerg has some stellar people. 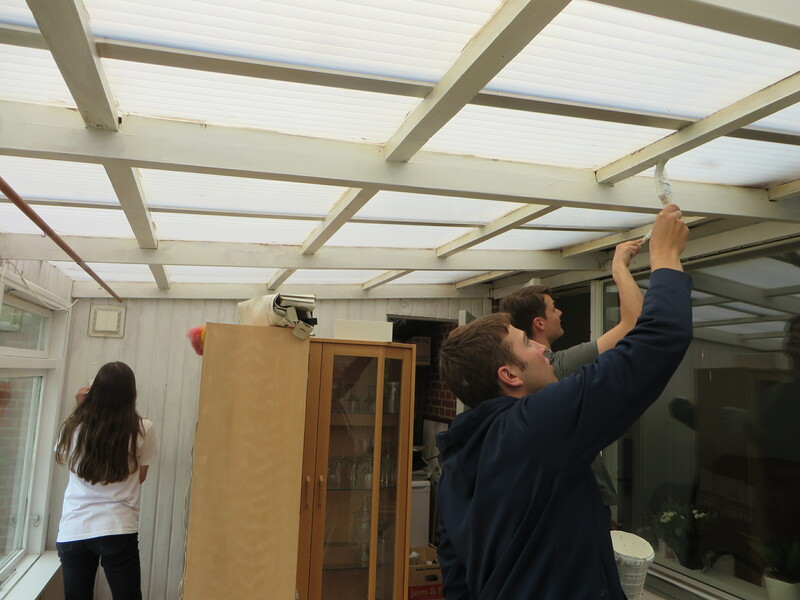 On Saturday we spent alllll day long painting Kirsten Søe’s indoor patio! It was SO much fun. I was thinking about my mom the whole time. She does a lot of painting projects. Then we had a party trying to get some little mini grills started because it was freezing cold and the wind was blazing. Luckily we got them started and were able to grill some bacon wrapped sausages and meat and I brought a potato salad and some jello given to us by our fine friend JoDee which she’d aquired from some American. It was super fun. We had a great conversation and our friend Gitte, from the ward, gave us a synopsis of the movie The Cokewell Miracle. This is something I need to see when I get home. Ja tak. It was a fun day. OKAY. I’m sorry. I am being transferred to Gladsaxe to open up the STL’s (Sister Training Leader) area! My new companion is Søs Sørensen the Second. We actually don’t transfer until tomorrow because of some problems with trains over on Fyn, so I’m still in Esbjerg right now. And I’m not actually going to my new area for a little bit. 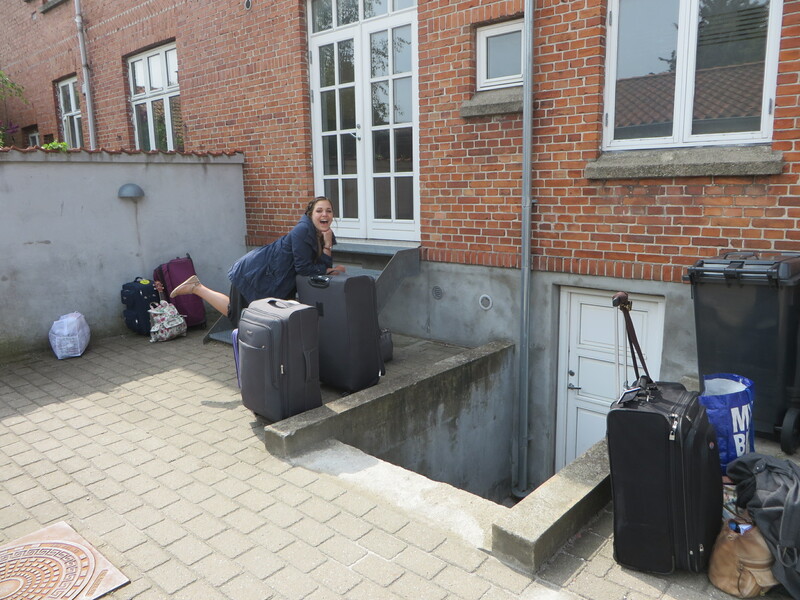 Here goes: So Søs Baggaley up in Aarhus is going to be training, but her trainee got sick and is staying in the MTC for an extra week, so tomorrow I’m going to be staying with Søs Orr and Søs Andrew up in Horsens while Søs Baggaley and Søs Batey go to Copenhagen for their trainer meeting. But on Thursday I’m going with Søs Orr to Copenhagen for Mission Leadership Council. Then I’ll come back to Aarhus with Søs Baggaley. Then sometime next week, when Søs Baggaley’s trainee gets in, she and I will go to Copenhagen where she’ll pick up her baby and I’ll be united with my babe Søs Sørensen, and we’ll open our area 🙂 Super duper exciting! Super duper excited! The ONLY downside is that I have to lug my luggage around EVERYWHERE. Why do I have so much stuff? 2 big suitcases, 1 carry-on, and a bike. Ugh. I really need to work my arms and shoulders out more. I think that’s probably why it’s called “luggage”. I AM SO EXCITED! Best last transfer EVER! I’ll see you next week in Aarhus! My lovely friend JoDee. I love this selfie! *DISCLAIMER* If you don't want to keep scrolling into eternity to get to a certain post or month, just go to the archives section and find which month you want.